Cute and attractive, it’s a great cup to carry along especially while traveling. Snack times can get really messy with lots of small pieces of food scattering all around. But with Munchkin Snack Catcher, snack times aren’t that difficult to handle. The cleverly designed snack cup, with its reach-through rubber flaps, keeps mess to a minimum and is great for travel snacking. The flaps are firm enough to hold snacks inside yet soft enough to allow little hands to pull snacks out. Snacks don’t scatter out even if the cup tips over. The protective bottom keeps tabletops scratch free and it also has a place to write kid’s name and personalize it. 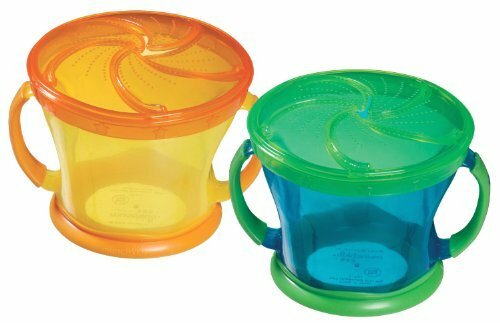 Munchkin clever Snack Catcher cup keeps bite-sized snacks inside the container until little fingers pull them out. Even if it tips over! The soft flaps make it easy to access and the little finger cleaning bumps are a special plus for keeping nearby surfaces cleaner. This is one snack holder that will catch your attention… and keeps messes to a minimum! Domed container holds 9 oz. of dry snacks. Protective bottom keeps tabletops scratch-free. A place to write child’s name on the bottom.